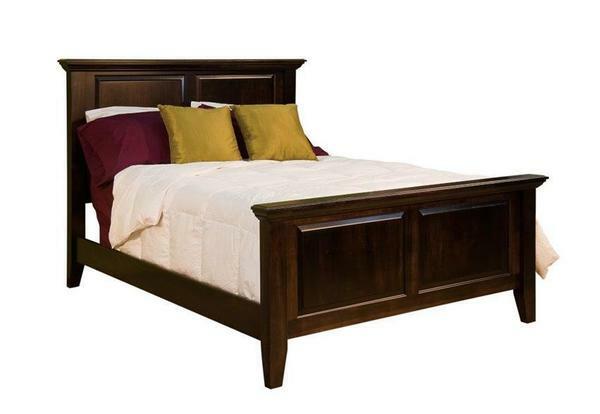 Build your dream bedroom around our beautifully handcrafted Amish Venice Bed. Constructed from solid hardwood, with elegant fabric/leather accents, you're sure to have plenty of options to form the perfect centerpiece for any bedroom in your home! Every piece in the Ida Bedroom Collection is made by skilled Amish woodworkers, using hand selected hardwoods with the utmost attention to detail. Because of this, you're sure to receive a unique, heirloom quality piece that will be handed down for many generations! Add the Venice Nightstand, Dresser and Chest of Drawers to complete this beautiful bedroom set! You can also add more storage for blankets and linens with our beautiful Venice Blanket Chest. If you have any questions or would like to start your order over the phone, please call on of our experienced Amish Furniture Specialists today, toll-free at (866) 272-6773.